This Friday, I'm thankful for new possibilities and maintaining a positive outlook (as well as the fact that it's Friday) so what better way to end the week than with a chat with Melanie Blodgett, event designer and force behind You Are My Fave Events? Not only does the woman plan parties for a living(! ), but trouble finding a new job is what spurred her to launch her own business last October. "I wasn't having much luck," she says. "Then I realized, 'Why not create your own job?' I thought about what I really loved doing and went after it." "I like my birthday," she writes. "I like performing victory dances when I win board games. I like polka dots. I like cute bikes. I like spin moves. I like planning parties. I like you unless you’re a hater." After you read her tips on working with a party planner and hosting your own summer festivities, I think you'll like her too. Hi, Melanie! So I just have to say, planning parties for a living sounds like such a fun way to spend your day! What are the best aspects of your job? What makes it incredibly stressful and how do you battle those moments? The best aspects of the job are when you finally see your idea come to life and make someone happy. Also, cake! I don't have any employees so setting up for a party can always be stressful. I usually enlist my husband for help and I'm not sure he's fan of slave labor. It always takes longer than you think it's going to! You offer services for a range of fêtes including weddings, birthdays and baby showers. What are your favorite to plan and how do you make sure the results are not only special, but also a reflection on your clients' tastes? 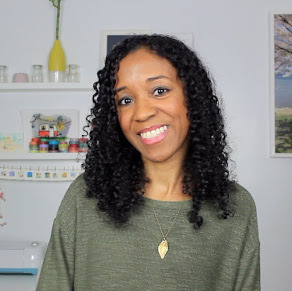 I love them all for different reasons but I would probably say birthdays are my absolute favorite because - and my husband will attest to this fact - I am a huge fan of my own birthday and so I have a desire to make them happy for other people as well. Before I work with a client we have a thorough consultation so I get a sense of what their style is. 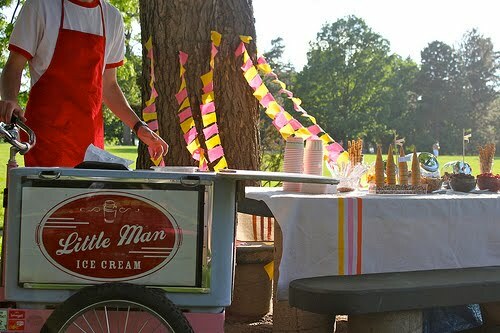 It's an essential part of any party planner's job, making the client happy. I also assume they've seen my previous parties and like them so that's why they've decided to hire me. Typically, how much of the final product is based on your guidance and suggestions and how much are details offered by the client? I think if a client is coming to me for help, they want to lead you in the right direction but let you do the work. We finalize a theme together and I update them throughout the process to make sure they're happy with the direction, but they put a lot of trust in me to make it work. My favorite clients might be the ones where most everything is a surprise to them at the end. When you finally show them the party, it's like a makeover reveal on "What Not To Wear" where everybody cheers. How do you keep your ideas fresh and where do you turn to for a dose of inspiration? I look at what other party planners are doing, read blogs and consume magazines like nobody's business, but at times that can get completely overwhelming and you start to feel like nothing is original anymore. That's when I step away from media for a couple days and let myself regroup. My best ideas probably come to me in the shower when there aren't distractions. How can clients help their planners produce party they want without turning into Bridezilla? Do your research before you hire someone. Do you like their style? Do you like other parties they’ve done? Ask them for recommendations before you hire them so you make sure you’re working with the right person. And don’t be afraid to say no in a firm but gentle way. I love hosting friends, but oftentimes I get so caught up in making sure everything's going well that I can't enjoy the moment. What should hosts keep in mind to avoid feeling stressed and overwhelmed? Try to prepare as much beforehand as you can. Keep things simple. If things don’t work out as planned laugh it off and improvise. People will remember the conversation, not the cake that collapsed in on itself. 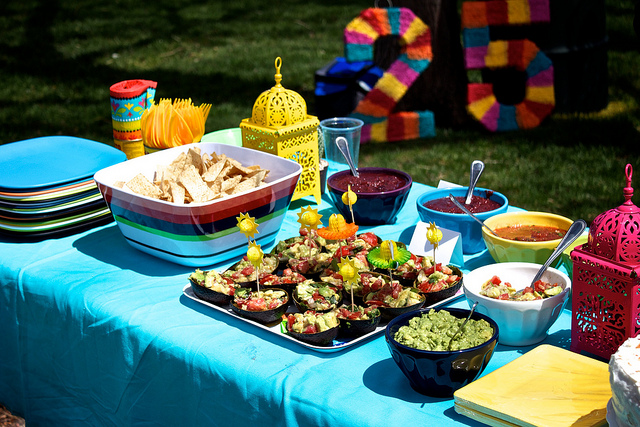 What are a few simple and fairly inexpensive ways that you can add a fun touch to summer parties? I can’t emphasize this enough: buy several strands of lights and hang them up. They make every occasion more festive. Also, homemade ice cream is always a hit. Whoa, homemade ice cream? Your friends must love getting an invitation to your place! 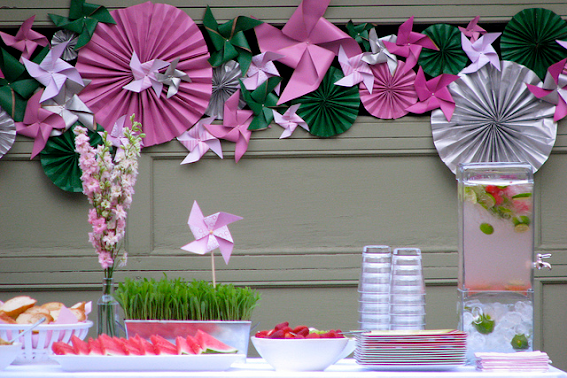 What other party details are you loving right now? For the summer, I like casual dinner parties outside with simple picnic foods. And I believe you can never go wrong with a room full of balloons. Unless they’re brown and maroon. Lights...I will have to remember that. And I totally agree with her about the homemade ice cream. It's my favorite part of Dad's 4th of July festivities.